White spots, LUCODERMA, Vitiligo is a disease condition of the SKIN, which spoils the beauty of body as well as Psychological and Physiological phenomenon with unknown pressure. We have successfully treated this condition by using the specific way of the treatment developed after the invention of ETG AyurvedaScan system. 4- Fourth step – after conclusion of the basic problem of patient, we select the most matching AYURVEDIC MEDICINES for the patient. This steps are for those patient, who can come at our clinic. Many patient of white spot desires for treatment, but they can not come to our clinic, for them we have arranged the treatment procedure , based on the experience and available facilities of PATHOLOGICAL EXAMINATIONS at every place and corner of the country. An Allopathy Medical student consulted me for her LEUCODERMA problem on 6th February 2011. 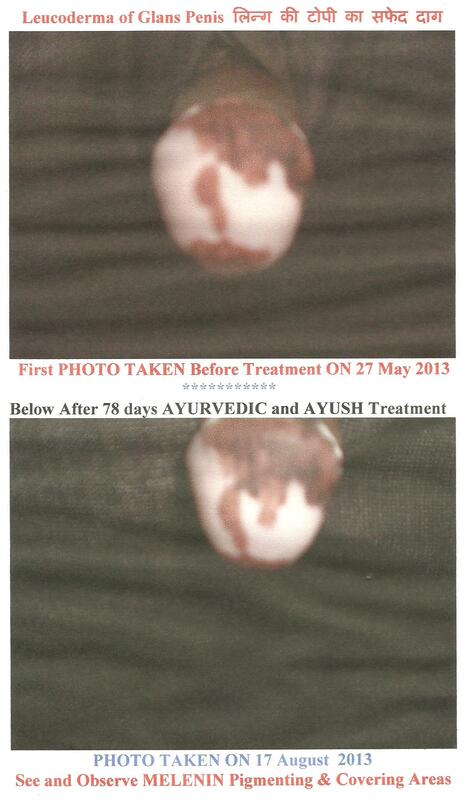 I recorded her ETG AyurvedaScan and the treatment was given her on the basis of the findings of the ETG report. The same day a Photo of the one part of the VITILIGO was taken by me for record purposes. The following PHOTO shows the anomaly. See, observe and compare the PHOTOS taken after a few months period. mere dad ko do sal se safed dag hai.please hume uchit pramras de k ye kaise thik ho sakta hai..
it was very much promising to know that you are aiming tretment of vitiligo with both pathies wise homeopathy and ayurved. As known to us both the pathies use natural source of medicines which are not causing side effects as costecorsteroids and other uv light effects.Still i had a question as homeopathy believes in bringing out the sympotoms and than tends to reduce or treat or pacify on thecontrary ayurved’s aim is to target the basic dosha vitiation or better to say treats to ends the problem within the body or system of the body. As you have mastered both the pathies and has got way out to treat vitiligo with combination of ayurved and homeopathy i am very much concerned to know what should be basic measures or methodology to be observed while using the combination thearapy? …………reply………..Using of combination therapy is bases on the findings of the four newly invented AYURVEDA DIAGNOSIS TECHNOLOGIES. 1- Electro Tridosha Graphy ; ETG AyurvedaScan 2- AYURVEDA BLOOD EXAMINATION 3- AYURVEDA URINE EXAMINATION 4- AYURVEDA THERMAL MAPPING AND SCANNING TECHNOLOGY. The findings and report is of 200 pages and the data provides IN 9 FILES, which is three dimentional , the first dimension finding is the PROBLEM / AILMENTS / FINAL DISEASE MANIFESTATIONS, WHICH IS FINALE WE SEE AND OBSERVE, THE SECOND one is the pathway / inclusion of path-organs and the third is ROOT cause / ROOT PROBLEMS. After diagnosing these three, conclusion is established , how and why the disorder is erected and where is the need of repairing the anomalies of organs, engaged in creating the main problem. This is very necessary before start of the treatment. When diagnosis is completed, it is observed, whether the remedies should be Ayurvedic or Homoeopathic or Unani or some others. It is also decided , what type of food and diet control should be instructed to patient, what he should do or what not to do. EHG HomoeopathyScan examination provides data of HOMOEOPATHIC PRINCIPALS. A 14 page report is given [with the repertorial analysis , if needed ] to diagnose the disease condition according to Homoeopathy. Monitoring after these steps, when after conclusion, decision for Ayurveda / Unani / Homoeopathic single or combination treatment is taken on merit of the choice of remedies. In so many ailing conditions, Ayurveda have best medications , but in some disease conditions, whether they are pathophysiological or pathological , Homoeopathic remedies are best. The selection of the remedies either solely Ayurveda or Solely Homoeopathic or in combination is decided on the need , if required. It takes atleast 8 to 10 hours, for completing the whole process. What you have done regarding treatment of your ward for VITILIGO, better you ask this question to your treating physician. As for as ours is concern, VITILIGO is 100% curable , if treated on the basis of the findings of the AYURVEDA LATEST INVENTED TECHNOLOGIES. Our research center have cured almost number of cases, who came for treatment at their earliest. Old and much time consumed mal-treated cases takes much time to cure, depending on their depth and intensity level of the problem and use of the kinds of the medications. We are treating successfully VITILIGO problems as we mentioned earlier. ………..reply………..kya ilaj kara rahe hai aur doctor jisase ilaj kara rahe hai usase apane kya puchcha?? I want to know more about ur lucoderma and can a female planning for conception take ur medicines. ?? ?? ?? ??????? ????? ????? ?? ???? ???? ?? ???? ???? ??? ???? ?? ?????? ??? ?????? ???????? ?? ???? ?? ???? ???? ??? ??????????? ?? ???? ?? ???? ?????? ????? ??? ?? ??? ???? ?? ???? ???? ?? ??????? ?? ???? ????? ??? ???? ????? ?? ???? ?? ???? ??????? ??????? ??? ?? ???? ?? ???? ?????? ???? ?? ???? ????? ?? ??? ????? ??? ?? ??? ?? ???? ???? ?? ???? ????? ???? ??? ???? ??? ???? ??? ???? ?? ???? ?? ???? ?? ??? ?? ???? ?? ?? ?? ??????? ????? ?? ???? ???? ? YOUR MENTIONED DISEASE CONDITION IS 100% CURABLE BY OUR LATEST INVENTED METHODS OF AYURVEDA DIAGNOSIS BY HI-TECHNOLOGICAL MACHINES AND AYURVEDA AND AYUSH COMBINATION TREATMENT AND AYURVEDA MENTIONED LIFE STYLE MANAGEMENT PROCEDURE’S ADOPTIONS. Mere poore body par 15-16 saalo se vitiligo hey. Kya apke treatment se yeh thik ho sakta hey? Please reply dijiye. Thankyou. YOUR MENTIONED DISEASE CONDITION IS CURABLE BY OUR LATEST INVENTED METHODS OF AYURVEDA DIAGNOSIS BY HI-TECHNOLOGICAL MACHINES AND AYURVEDA AND AYUSH COMBINATION TREATMENT AND AYURVEDA MENTIONED LIFE STYLE MANAGEMENT PROCEDURE’S ADOPTIONS. ETG AYURVEDASCAN PARIKSHAN KARAKAR AYURVEDIC / AYUSH YANI AYURVEDA AUR HOMOEOPATHY AUR UNANI AUR YOGA PR——-AKRATIK CHIKITSA KA MILAJULA ILAJ KARANE SE SABHI TARAH KE ROG JINAKO LAILAJ BATA DIYA GAYA HO YAH SABHi AVASHY THIK HOTE HAI.